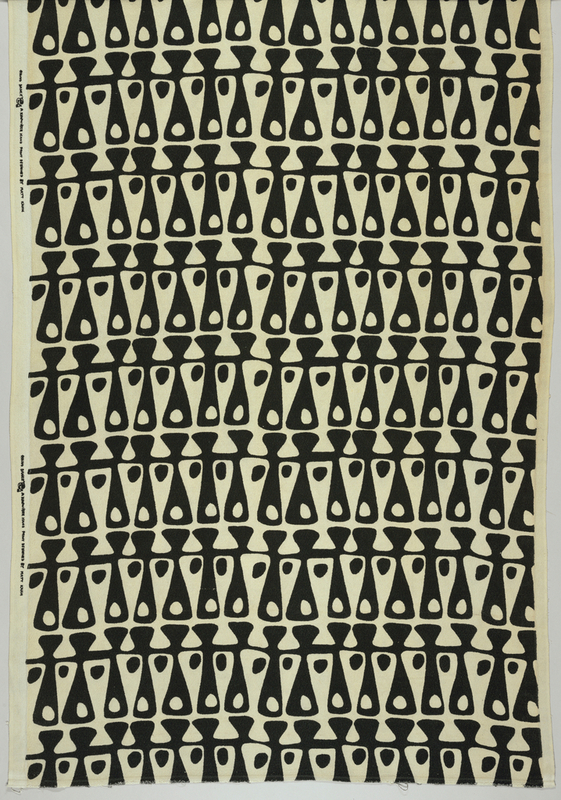 See more objects with the tag pattern, dance, black and white, round, abstract, textiles. This is a Textile. It was company: Kohnwiser and made by Matt Kahn. It is dated ca. 1947 and we acquired it in 1987. Its technique is screen printed in black on a broken twill foundation. It is a part of the Textiles department. Warp: 270cm (106in.). Weft(selvedge to selvedge): 119cm (46 3/4in.). Pattern: Height of screen: 33 in. Height of visual repeat: 8 1/4in. Printed on left edge: " Round Dance (logo) A Kohnwiser handprint designed by Matt Kahn"